Every Christmas has a place for a Scrooge or a Grinch. So celebrate it this Christmas with one of these adorable Bah Humbug Knit Christmas Pet Sweaters. We know you can already imagine this sweater on your pet. It's hard not to, its just that cute. This Christmas pet sweater is adorned with beautiful Rhinestones. Don't wait and get one while supplies last. The Mirage Christmas pet sweaters come in many sizes and should be a great fit your pet. 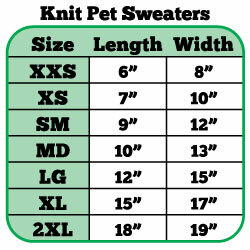 See the sizing chart below for more details on which size pet sweater is best for your dog or cat. Purchase a Mirage Knit Bah Humbug Christmas Pet Sweater Now!